[Server Name:443]. Database temporarily unavailable or has network problems. Effect of this is that the plug-in can’t authenticate and therefore, connect to the database. Fire up the “Services” MMC. 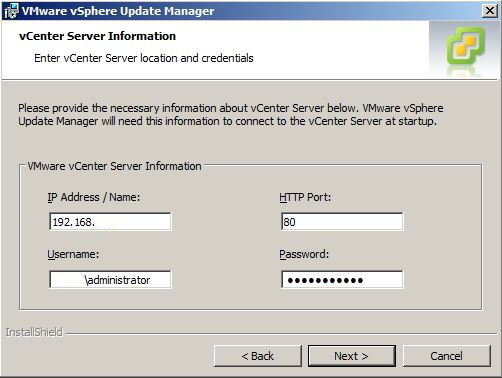 Locate the “VMware vSphere Update Manager Service”. Click on the “Log On” tab. 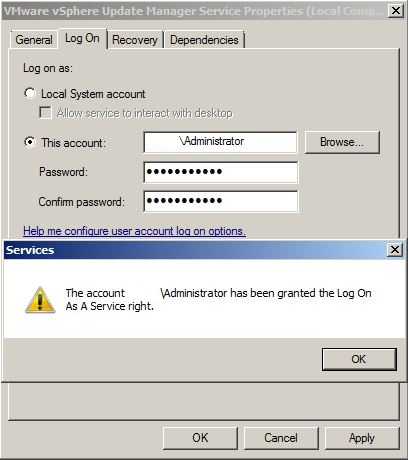 Change “Log on as:” from “Local System account” to “This account” and add the service account you chose to run the service under. Once done, a dialogue box comes up, telling you about the “Log On As A Service” right being granted to that account. Remember: You also need to restart the service for this change to take effect. Once done, you can quite safely go to the plugin install and this time, it should work perfectly as normal! Timely and helpful post. Thanks for sharing! My SQL database resides on a separate server. There were no problems with the ODBC driver connectivity from the vCenter server to the remote SQL server or the update manager service user and password, changing these did nothing to help, the real problem was the transaction log for update manager database. Hope this bit of information helped. Thank you!!! after five day of research. Worked perfectly for me. Good screenshots with ability to enlarge them. Thank you. This only works if your VCenter server is a Windows box. What if you have this error and you are using an Virtual Appliance? A very good question! Unfortunately, I can’t answer that one as I haven’t seen that one yet. Ahhh. That was the ticket. Over four years on and still a very useful and helpful blog post. You rock sir!